So I haven't blogged since like, oh, Saturday. I feel like a big ole slacker, y'all. Yesterday was just crazytimes at work; literally one of those days that began with a 3+ hour meeting and was followed by an onslaught of frenzied emails/phone calls for the remainder of the day. So yeah, blogging didn't exactly take front and center. Anywho, Monday is O-V-E-R and today is Tuesday, (which is a definite "upgrade" in my book). So let's talk about beauty products, m'kay? Let me begin by saying, I'm a bit of a product junkie. Can't help it. It's a sickness and I'd get treatment, but that would likely be very expensive. And in my opinion, that's money better spent at Sephora. I definitely have designated seasonal products. You know, like lighter moisterizer for summer and heavier conditioner for winter, etc., etc., so on and so forth. I blogged about this miraculous stuff a couple weeks ago and I'm still loving it. It makes my thick hair behave about as well as it's ever going to. And it smells good- bonus! Make no mistake, this gel-based moisterizer packs a powerful punch. It feels super light on your skin and absorbs fast, so it's perfect to wear underneath make-up. I use it for day and night. This bath cream was made in heaven and is currently sold at Sephora. It smells super sweet and leaves my skin feeling really soft, which is important during the winter months. Picked this shade up last week at The Mothership and LURVE it. I'm definitely a gloss girl during summer, but I like a bit more color in fall/winter. I love the drama that lipstick provides and this color gives me just the perfect amount. I'm all about a smoky eye in the fall and winter. This shadow looks intimidating, but it's actually very pretty and soft when applied. It's thick, it stays on pretty well and it makes my shrimpy lashes pop. Nuff said. This opaque grey plum shade practically screams winter. I'm currently sporting it on my toes, but since peep-toes are about to give way to boots for the next few months, I'll likely be painting my tips soon. I love using this stuff if I'm pressed for time and need to freshen up my hair. You just spray it in like hair spray, making sure to concentrate it at the roots. The end result? Your hair feels freshly shampooed and you still have time to grab a latte before work. Ok, so those are a few of mine, but of course a girl could always use some more. So tell me, what are YOUR fave products for fall? I may need to try this conditioner. My hair is getting out of control lately! I want to try the Philosophy body wash! Moisture Surge is the best thing that ever happened to me. I tried it for the first time when Dillard's had settled that huge suit and had to give away a bunch of free stuff :) Love it! I have the Clinique Moisture Surge and I love it!! I need to get that conditioner-I said that the last time you posted about it. I'm off to go order it off the internet before I forget. Thanks for the other product mentions :) My wallet is groaning at me as speak! I love that Philosophy stuff. The holiday line is amazing! Your bathroom cabinets must be full to the brim!! I knew Fall had clothes but I didn't know that Fall had products. I'm learning so much from you!! Gteat list of products! 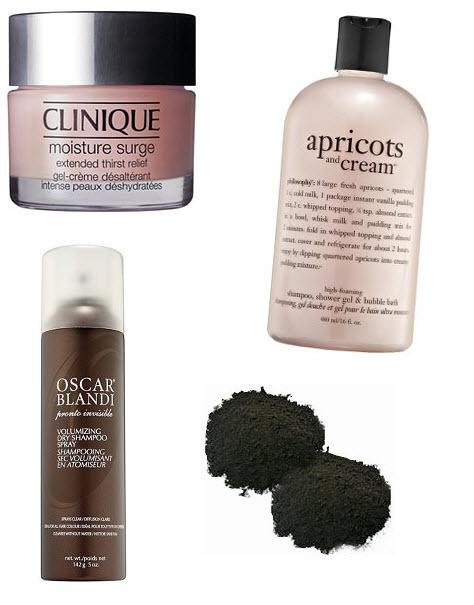 I absolutely love the "Living Proof" line of hair products and Oscar Blandi too. I agree, forget rehab or therapy for your addiction and put that money into more time spent shopping at Sephora! right now, i heart the mentha glosses from b&bworks....they are the perfect shade and have that slight hint of mint so it makes me feel like i have fresh breath! I've been craving some new product suggestions! I'm getting a little bored and need to switch it up for some much needed pizzazz! Thanks for these tips - dying to drop by Sephora now! Philosophy is great! I love all of their products!